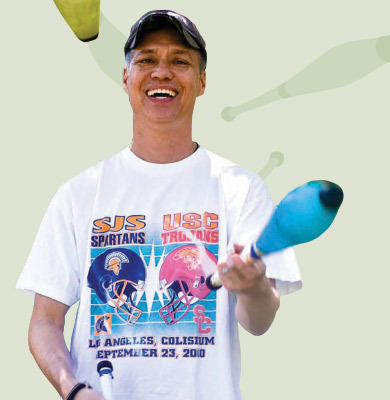 During his SJSU days, Richard MacKinnon, ’89 BA, ’92 MA, Political Science, could be found out on Tower Lawn, practicing his juggling skills. (He was vice president of the Juggling Club.) These days, based in Austin, he’s proving himself to be a juggling wizard of a different sort. CEO of the mobile feedback service Mifft, CEO of the WiFi firm Less Networks, president of the nonprofit initiative that quashed “for pay” WiFi in Austin (Austin Wireless City Project), he’s also Austin’s transportation commissioner, BorgFest organizer (“to celebrate cyborgs and their fans”) and pulls shifts at a friend’s restaurant. MacKinnon doesn’t have a work desk—anywhere. He has a laptop and a phone. Read on for more about MacKinnon’s business savvy and government service. Raw intelligence isn’t enough to succeed. An instinct for making money is crucial. Chase after the people who are supposed to pay you and everyone else will find you. Never underestimate the high school whiz kid. Don’t let preconceived notions of age and maturity restrict your ability to work together. Venture capital is a formidable, tangible force. It will divide, shape and transform companies and partnerships, and make some (of the many involved) disproportionately wealthy. Smart doesn’t necessarily mean convoluted. Respect straight-forward “simple” business models. Always ask: Would a customer want to buy this? rather than Wouldn’t it be cool if we made this? Starting up is easy; keeping going is hard. Currently CEO of the mobile feedback service Mifft and of the WiFi firm Less Networks (his fourth start-up), MacKinnon started working in the high-tech biz when online communities and wireless Internet counted as the wild frontier. Curious about what a frontiersman by trade sees as the next “disruption to the workplace”? In serving as Austin’s transportation commissioner (since 2007) and Capital Metro liaison (since 2008), MacKinnon brings his entrepreneurial and network know-how to the government side of the table.